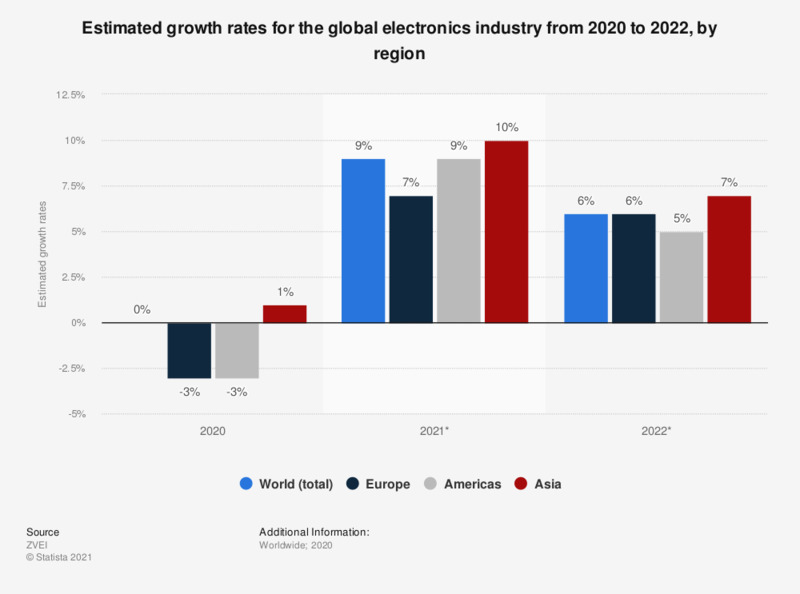 This graph shows the estimated growth rates for the global electronics industry from 2016 through 2018, by region. In 2018, the European electronics industry is expected to grow by around two percent over the previous year. The electrical and electronics industry comprises a variety of products, ranging from aerospace products, lamps and light fixtures including light-emitting diodes, consumer electronics such as television sets, electrical household appliances, electronic medical equipment, microelectronic components and automation systems to automotive telematics such as on-board diagnostics (OBD), in-car touch screens, park cameras and navigation systems. In the consumer electronics segment, growing demand for selected products related to the ‘connected home’ concept, as well as for media tablets and smartphones is expected to offset declining sales of personal computers. Globally, the industry is expected to grow by around four percent between 2016 and 2017. Although the outlook for Japan’s electrical and electronics industry continues to be bleak, Asia is predicted to experience the strongest growth. The European electrical and electronics market is projected to grow by around three percent annually. The figures were calculated at constant exchange rates. Canada: Which of the following electronic products do you own? How would you describe the business growth outlook for your sector in China over the next two years?